As winter releases its grip on the Antarctic, the sea ice begins to recede and marine wildlife returns to the region, leading expedition cruise operator, One Ocean Expeditions (OOE), celebrates its 10th year of transporting intrepid travellers to the ‘White Continent’. The beginning of the Antarctic season is the optimum time to view wildlife in the Southern Hemisphere as many species return from warmer climes. The waters are rich with marine life, bringing humpbacks, orcas and minke whales to feed on abundant schools of krill. Penguins head back to rookeries in the thousands as the mating season begins. Weddell and leopard seals become playful and hungry, feeding on the fresh ocean delicacies brought by the new season. It’s an ideal time for keen photographers to take picture perfect shots of plentiful marine wildlife! It’s also the time of year when many scientific research stations re-open on the Antarctic Peninsula. OOE supports and facilitates world-leading oceanographic and marine mammal research. The organisation – which puts education, polar exploration and science at the forefront of its values - provides more than 120 days per year of ship time for accredited science projects. Carefully selected research partners travel alongside guests on OOE polar cruises, conducting relevant and meaningful research projects while on-board. Amongst them, renowned scientists and academics include Dr Ari Friedlaender, a university professor and leading marine mammal researcher involved in a ground-breaking whale feeding study. Ron Naveen, Founder of Oceanites, is also a regular on board, conducting important penguin behaviour and census research work, and supporting innovative climate change and polar environment studies. “At One Ocean Expeditions, we are committed to supporting on-going scientific research, as well as offering our guests and staff the opportunity to meet and interact with acclaimed experts in the intimate setting of our expedition vessels”, says Aaron Lawton, Operations Director at One Ocean Expeditions. 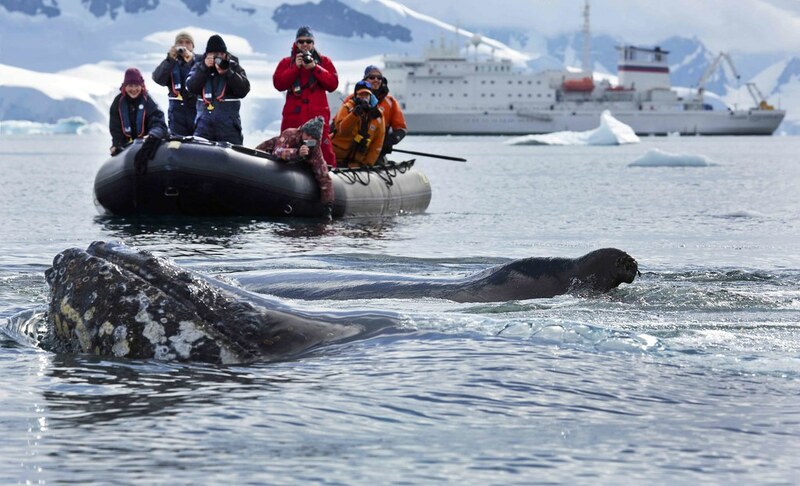 Expedition cruising to the Antarctic is the ultimate experience, not only for scientists, amateur and professional photographers, but for families and intrepid travellers who have adventure at heart or a deep appreciation of the environment, ocean and wildlife. OOE’s 10-night 'Christmas in Antarctica’ voyage is certainly one to add to the Bucket List! Price starts at USD9, 195 per person sharing a triple cabin. Other options include the 10-night ‘Antarctic Marine Mammal’ voyage and the 10-night ‘Antarctic Peninsula Adventure’ voyage in March 2018, when guests will have the opportunity to witness leading scientists conducting and explaining their research. Their investigations will provide vital information on the feeding patterns, social habits and the role that wildlife, especially whales, play in the Antarctic ecosystem. OOE’S 2017/18 Antarctic expedition cruises start from USD$11,295 for a 10-night voyage in a private twin cabin on one of the company’s fleet of premium ice-strengthened ships. Included in the price is on board accommodation, all meals, room amenities, daily zodiac excursions, expedition gear package and educational seminars and lectures led by expert staff and renowned guest speakers.